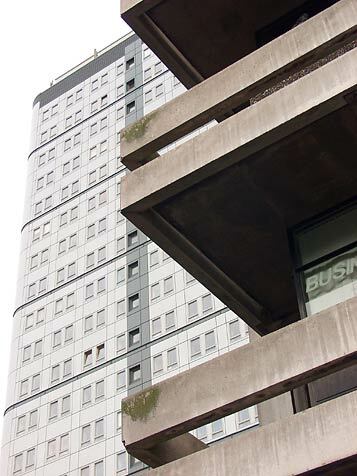 Bewick Court dominates the city skyline with its 21-storey (including roof utility floor) 77metre rise, perched on a platform spanning John Dobson Street. It was built in 1970 as part of the ambitious 60's plan to create a bold new international commerce and culture centre out of the collapsed coal and heavy engineering background of the region. The planner and his architect ended up in prison after a sensational trial where it was revealed that corruption on a massive scale had taken place in awarding contracts and "easing" the passage of planning decisions. The story was retold recently by Peter Flannery in BBC's BAFTA winning drama series, "Our Friends In The North". 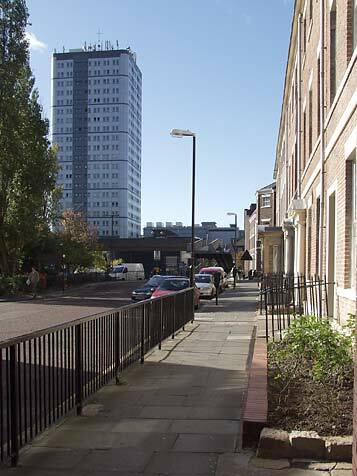 Bewick court contains 133 one and two bedroom apartments and was originally built by Taylor Woodrow Construction for the Woodland Housing Trust, but it has been owned and managed by the North British Housing Association since 1978. Over £4million (5.72 million Euros) has recently been spent in refurbishing the block. 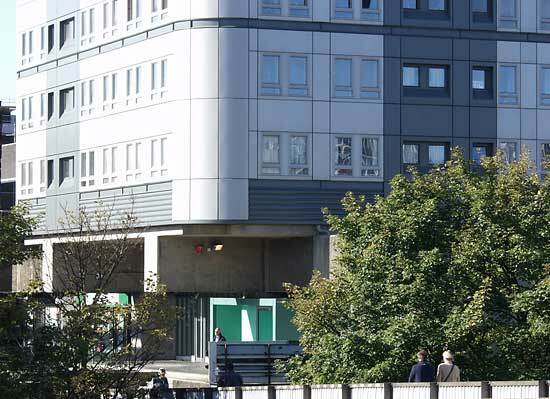 As well as the obvious modular cladding and re-fenestration, the interior areas have been given a facelift along with improvements to the living spaces. 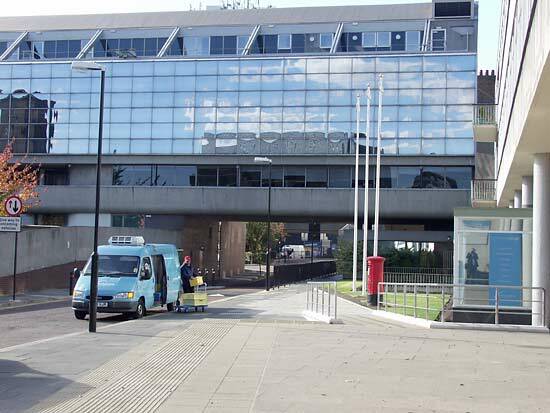 Funding came from a mix of public and private sources, the architects were Red Box Design, and the principal contractor was Kendall Cross. The army of workers required, skilled and semi skilled were recruited locally through the Newcastle Employment Bond initiative. 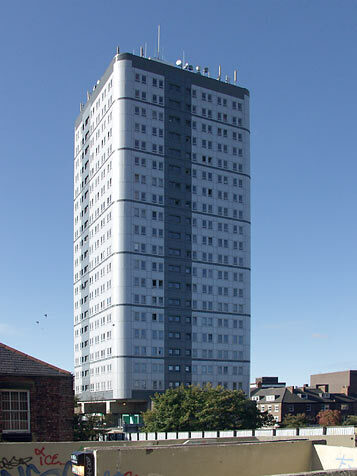 Bewick Court is not the highest building in Newcastle, that prize goes to Vale House in Lansdowne Gardens beside Jesmond Dene at 80metres and 28 floors. See a comparative chart here. 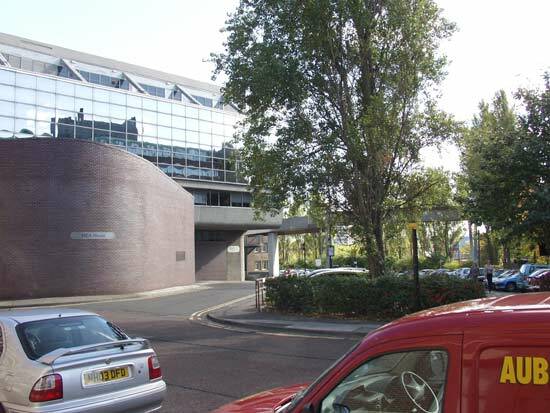 As is obvious from the photos, Bewick Court is a prime site for radio aerials, and many cell phone transmitters and microwave links are based here. The origins of this architectural approach, the International Style, lie with Walter Gropius, a revolutionary and captivating German designer born in Berlin in 1883, best remembered for creating and inspiring the Staatliches Bauhaus School. Gropius was appointed Director of the two Weimar art schools in April 1919 and he combined them in new radical premises at Dessau, designed by him but built by the students and local artisans under his direction in 1925. The school captivated many brilliant artists both as teachers and as students, including Wassily Kandinsky, Paul Klee, Josef Albers and Laszlo Moholy-Nagy. It set the standard for modern architecture and design but was far too radical for the Nazis, who closed The Bauhaus in 1933. By then Gropius was in private practice and uncomfortable with the rise of Nazism in Germany under its firebrand anti-Semitic leader, Adolf Hitler. He left for London in 1934 and later to the United States in 1937 when he was appointed professor of architecture at Harvard University. It was here, by introducing the Bauhaus concepts of collaboration, simplicity and ergonomics in materials and design, and total departure from previous form that the International Style was born, and greatly influenced a generation of architects, including Pietro Belluschi and Philip Johnson. By 1946 Walter Gropius' deep belief in design teamwork led to his forming the Architects Collaborative, a group responsible for commissions such as the Harvard Graduate Centre (1949), the US Embassy in Athens (1960) and the University of Baghdad (1960). However, perhaps his most contentious project was the Pan-Am building, now the Met-Life Centre, in New York. Its 246-metre 58-storey brutality rises across Park Avenue and several admirable buildings were demolished to make way for its colossal construction in 1963. Only by immense public pressure, that Gropius found incomprehensible, were the nearby Helmsley building and Grand Central Station saved from his ever more promiscuous demolition ball and steam hammer. Gropius had a charm that attracted others to his cause, and his insistence on teamwork meant that he could control others without their realising it. Maybe Gropius was unaware of the power of his influence. This movement was truly international and the vogue for ripping out worthy but older structures and imposing cubes and stark planar steel and glass rectangles was popular because it was a relatively cheap way of making a massive impact. No self respecting 1960s and 70s planner or architect could fail to be beguiled by such a prospect. Walter Adolph Gropius died in 1969. Bewick Court is named after one of Newcastle's famous artists, Thomas Bewick (1753 - 1828) whose illustrations and woodcuts of nature and birds in particular singled him out as the definitive influence in English book illustration. The entrance to the building is shared with a whole food and vegetarian restaurant, "Supernatural" and a food store. The huge structural beams protrude under the first floor and loom over the entrance as if to reinforce the threat of that massive structure overhead. 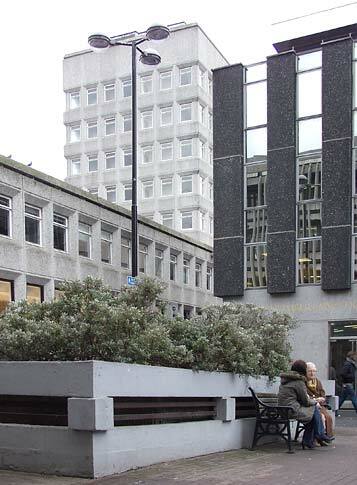 Those planters have been left bare, and the autumn leaves lend an air of neglect to this area that belies the millions just spent. 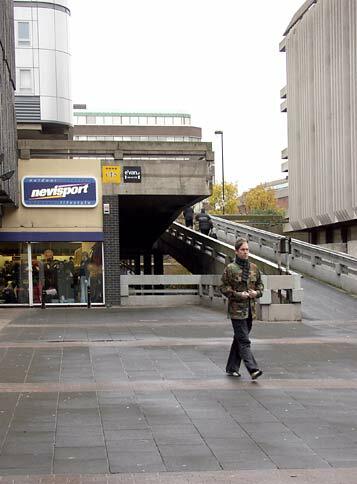 In the distance is Princess Square that arose from the void left by the fire that consumed Callers department store. 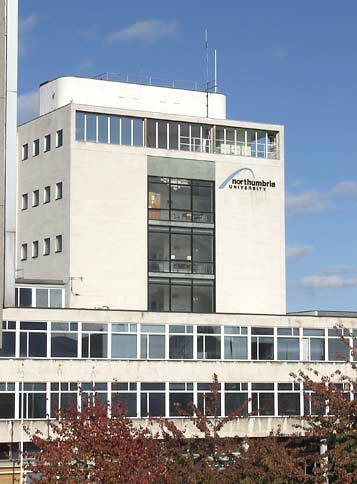 The University of Northumbria at Newcastle was formed from the Newcastle Polytechnic, whose first building was the main Squires building and its central square with adjoining Students' Union on one side, and the later library on the other. It is good to see that they got the priorities right here, booze before books - that's the student way! 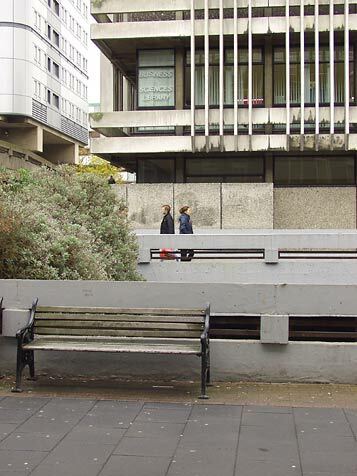 The site was developed along St. Mary's Place created and cleared during the late 1960s to complement Kenyon's Civic Centre on the opposite side of the road. 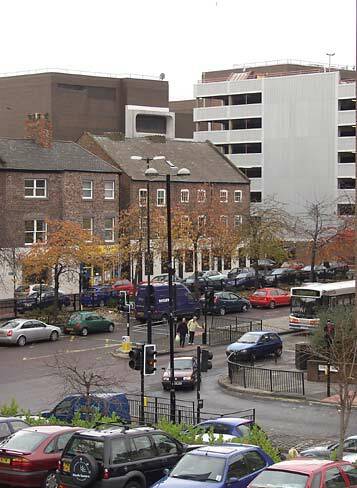 The Victorian town housing and small commercial properties, some examples of which still remain in the stretch of St. Mary's Place opposite St. Thomas' church, were flattened to make way for this grand gesture and the nearby new north-south route, John Dobson Street designed to remove vehicles from the predominantly retail Northumberland Street. To the south of the main site are a collection of older buildings used by the University and here at Ellison Place the Edwardian grandeur has been squelched by a Social Services monstrosity called MEA House. The name is derived from the initials of the people responsible for causing this alien craft to crash land on a quiet urban square frequented by clergy and doctors. I have to admit that the building is well constructed and given that it is wedded to the glass planar school of thought does use the technology thoughtfully. However, where I take major issue with the planners is its siting. Please, anywhere but here! At the time of its construction in the 1970s there was a long derelict rail goods station, bombed during World War II, just yards away. 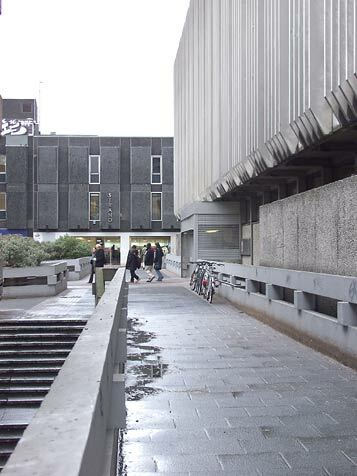 The International Style and its brutal aspects and out of scale and out of place forms infect our cities and threaten to consume all before them with their spiky, massive jaws. Thankfully, later architects and planners have turned to more human oriented designs. Here at John Dobson Street the box tentacles of the NCP car park vie for position with the C&A building with its oh-so-modern curvy-boxy decoration that fools no-one. Gropius' shadow falls on cities today as surely as the gloom cast by his buildings. 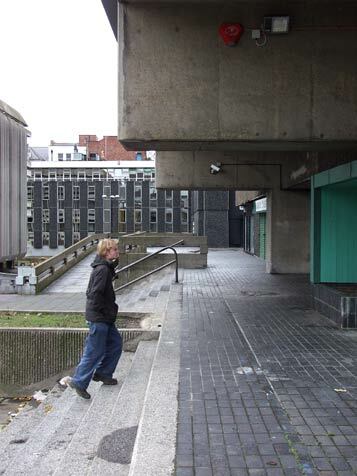 However, the brutalist fashion has almost gone from building design. Some of the methods and a lot of the collaboration continue, but today it is more likely to be a group effort between the designers and the users rather than the thinly disguised form of self-aggrandisement and dominant conformity practised by the charismatic Gropius.